Speculative Romance Author Regina Paul: New E-book!! 404 ~ Page Not Found! Home » adult coloring book , coffee time romance e-bookstore , pretty mandalas , regina paul » New E-book!! Well, I freely admit it, I've been AWOL for a a few months from my blog and website, but...I have a really good reason, one that I am super excited about! During that two month period I was working on my first adult coloring book. I'm sure you're all like, "coloring book?" I thought you wrote romance! Have no fear, an new romance book is in the works as well and I'm hoping to have that finished and out by December 2015. 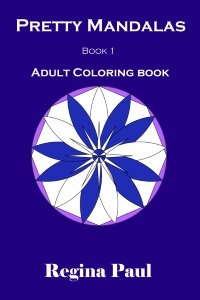 So, without further ado, I want to share with you my brand new adult coloring book Pretty Mandalas, Book 1, Adult Coloring Book. This is an e-book by the way, not a print book and I'll tell you why. I love coloring books that are e-books because I can print the designs multiple times and try different color schemes. While print books are great, you always have the issues of the possibility with the printer putting part of the design in the binding, or not centering it even though you sent them the document with it centered, or crappy paper that bleeds through to the next design, leaving you with a design you can't then use, just to name a few. Most of the authors who have created adult coloring books and used Createspace have had one or more of these issues, so I've opted to go e-book only for the time being. I may eventually put the book into paperback, but for now I'm hoping my readers and colorists will prefer as I do an e-book. Oh, and while the designs and book are copyrighted, you are are free to print out the designs and color them as often as you like for personal use only though. Right now the book is available through the Coffee Time Romance E-bookstore and it's 20% off which means instead of $2.99, it's $2.39, so take advantage of it while you can, this reduced price will be gone soon! Oh, and the mandala on the cover is just one of the 25 designs, that range from simple to complex. 25 pretty mandala designs for the discerning colorist. With both simple and complex mandala designs, adults and older children who enjoy coloring are sure to find something to tickle their fancy and inspire their creativity! This e-book is offered in a PDF version only so colorists can print as many copies of the designs to color as they like. Coloring books have been around for a lot longer than most folks think. In fact, the first coloring books were created by the McLoughlin Brothers partnering with Kate Greenaway who initially published the “Little Folks Painting Book” in 1879. They continued to publish coloring books until the 1920’s when they joined the Milton Bradley Company. Before crayons, coloring books were intended to be painted rather than colored with crayons. Also, even after the 1930’s when crayons were invented, coloring books were made so the pictures could be both painted and colored so users had a choice. Another historical fact that many people don’t know is that in the beginning some coloring books were actually used to advertise products such as the one created by Richard F. Outcault who created the character Buster Brown to help advertise shoes from the Brown Shoe Company. This character was well known to Americans in the early twentieth century since he was also the star of a comic strip by the same name. Coloring books were also created to showcase coffee and piano brands as well! More recently we’ve begun to see that coloring books aren’t just for kids anymore! In fact, there are hundreds of coloring books created just for adults. While there were coloring books for adults prior to the adult coloring book boom that has taken place in 2015, Scottish artist Johanna Brasford has been the one to really get it going, starting with her first adult coloring book, Enchanted Forest: An Inky Quest and Coloring Book. Since then there has been no stopping adult coloring book creators, nor the adults who want to color!